Beauty In The Mirror: NEW Flutter & Drum Beauty / Fashion website! NEW Flutter & Drum Beauty / Fashion website! A new website called Flutter & Drum launched recently and I wanted to give it a big shout out because I think it deserves the recognition. 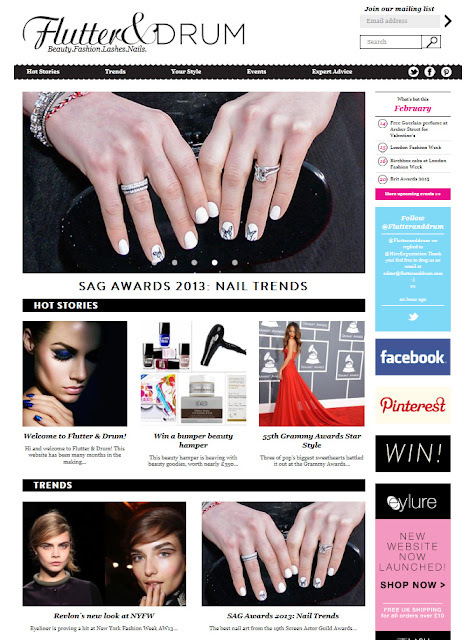 A great one-stop website where you can see the latest beauty and fashion trends displayed in a great easy to follow and read layout. Some beauty and fashion websites can be a little overwhelming but Flutter & Drum has a really relaxed but fun feel about it. They have a fabulous hamper to giveaway and it ends in a couple days so please be sure to pop over and enter, when you see the gorgeous goodies you'll be crossing everything! You can also follow Flutter & Drum on twitter and keep updated with all the latest celebrity gossip and new wonder products to hit the beauty isles- @Flutteranddrum.